The Art of Cultivation—Do You Really Need It? Cultivation, also known as tilling or soil refinement, is the act of digging into or cutting up an existing soil bed to better prepare it for planting. You might use a tractor, a rototiller, or hand tools like a shovel or soil fork. Typically, farmers add amendments when they cultivate soil to boost its nourishment. Organic cultivation specifically aims at getting soil into healthy shape by using nonchemical, pesticide-free methods and by encouraging the soil's natural ecosystem to thrive. Effective organic soil cultivation helps control weeds and produce healthy plants. Aerating—or exposing the soil to air—is an integral part of the cultivation process. Cultivation can be essential in a nontoxic, integrated pest management solution. The whole point of cultivating your soil is to help your plants grow better. You want aerated soil so that your plant's roots can get enough exygen. You want your soil to be free of weeds. And you want good drainage so you don't drown your plants. In terms of organic farming, it’s not just about adding nutrients to the soil. It’s about encouraging the life forms within the soil to thrive. Earthworms are the most obvious soil dwellers, and you want them around to process organic matter into rich, fertile soil. Earthworms also keep your soil aerated. But your soil also is home to billions of beneficial microorganisms such as bacteria, algae, and mold. When these organisms are happy, thriving, and in ideal balance for your agricultural conditions, they turn lifeless dirt into living, nourishing soil. The right mix of digging up dirt and working in natural amendments helps your plants thrive. Overcultivating can damage soil, however, so there are times when you shouldn’t cultivate, both seasonally and year-to-year. Spring often is the ideal time to cultivate your soil in preparation for new plantings. Fall, on the other hand, can be a better time for simply mulching, which involves spreading a thick layer of organic material over your soil to protect it during the coming colder months. Digging up your soil in the fall can kill essential organisms, disturbing the balance of life forms in the soil and even encouraging weeds to grow. Your soil might benefit from heavy cultivating with a rototiller in some years, while it’s best to use gentler hand shoveling or forking to prep the soil in other years. Your type of soil should dictate when and how you cultivate. Dense clay soil can be difficult to dig up and cultivate, and it doesn’t respond well to being heavily worked when it is waterlogged. Better to cultivate clay soil in the fall in some climates when it's relatively dry. Because clay retains water and can overhydrate some plants, it's a good idea to incorporate sand from a riverbed into the clay to break it up a little bit. Loose, sandy soil does not retain water as well as clay and can benefit from springtime cultivation to provide enrichment that helps it retain moisture. The amendments you work into your soil also will vary greatly depending on their type and the nutritional needs of the crops you intend to plant. Cultivating your soil is one step in the process of growing healthy plants. It's important to see your crops through their entire cycles, from seed to table. Keep some important decisions and practices in mind along the way. 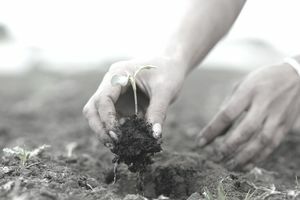 Planting: Whether planting seeds or transplanting crops, it's important to leave enough space between each plant to allow roots to take hold and so each plant can have access to enough sunlight and nutrients. Gardening Know How provides a handy chart that lets you know how much space to allow for most common crops. Water management: Know the needs of the crops you are planting. Many beans, for example, are capable of thriving in dry conditions, so if you live in an area with little rain, beans might be a good crop option. As well, plants with deep roots, like tomatoes, also can thrive with limited watering because their deep roots can draw moisture from the ground. On the flip side, crops like lettuce, cabbage, and celery require a lot of water, so avoid these and similar crops if you live in a dry area. Plant health: Making sure plants are healthy involves a number of practices. Test your soil to know what nutrients it has and what it might lack. Fertilizers high in the nutrients your soil lacks can help create a healthier environment. As well, protect your crops from outside threats, including animals that might like to munch on your vegetables and insects that do the same. You also want to protect against weeds that might compete for moisture, sunlight, and necessary nutrients. Harvesting: The most important part of harvesting is knowing when crops are ripe and picking them as soon as possible when they are ready. Read up on the crops you are growing so that you know what to look for, and go through the garden every day to pick what is ripe. Postharvest: Postharvest is a good time to test your soil. You'll be able to see at this time what your plants may have been lacking and what can be done differently for the next growing season. Crops and seed selection: To have the most success with your crops, choose plants that will thrive in your environment and select the highest quality seeds.